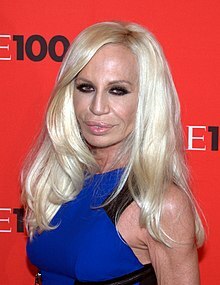 Donatella Francesca Versace (Italian: ; born 2 May 1955) is an Italian fashion designer and current vice president of the Versace Group, as well as its chief designer. During the 1980s, Donatella's brother, Gianni Versace, launched a perfume dedicated to her, Blonde, and gave her her own fragrance label, Versus, which Gianni formerly ran for her. After Gianni's death, Donatella took over all aspects of the label. She was born in the Italian city of Reggio di Calabria, the youngest of four children. Her father was a personal financier to the Italian aristocracy. An older sister, Tina, died at the age of twelve from an improperly treated tetanus infection. Her brother Santo Versace owns 30 percent of Versace stock. Vice-President of Gianni Versace S.p.A.
Creative Director of Gianni Versace S.p.A.
Donatella Francesca Versace (Italian: [donaˈtɛlla franˈtʃeska verˈsaːtʃe];[lower-alpha 1] born 2 May 1955) is an Italian fashion designer and current vice president of the Versace Group, as well as its chief designer. During the 1980s, Donatella's brother, Gianni Versace, launched a perfume dedicated to her, Blonde, and gave her her own fragrance label, Versus, which Gianni formerly ran for her. After Gianni's death, Donatella took over all aspects of the label. She was born in the Italian city of Reggio di Calabria, the youngest of four children. Her father was a personal financier to the Italian aristocracy. An older sister, Tina, died at the age of twelve from an improperly treated tetanus infection. Her brother Santo Versace owns 30 percent of Versace stock. In the mid-1970s, Donatella followed her older brother, Giovanni ("Gianni"), to pursue knitwear design in Florence, Italy. She had planned to work for her brother in the public relations department, but was more valuable to him as a "muse and critic", according to her during an interview with Vogue. Through her closeness to her brother's enterprises, she entered the fashion world. During the 1980s, Gianni launched a perfume dedicated to her, Blonde, and gave her her own label, Versus. On 18 July, 1998, one year and three days after Gianni’s death, Donatella Versace mounted her first couture show for the Versace Atelier at the Hôtel Ritz Paris. She built her runway over the hotel's swimming pool, as her brother had done every season, though this time using sheer glass. She now oversees the production of a dozen collections each year, though these days she is just as famous for her celebrity entourage and parties whose regular guests include Sir Elton John, Liz Hurley, Catherine Zeta-Jones and Kate Moss. Even Prince Charles attends Donatella's parties for the famous and elite throughout Europe. She soon proved to be important to Versace PR and spread its name throughout Europe and most of the United States. She placed Jennifer Lopez, Madonna, Courtney Love, Christina Aguilera, Jonathan Rhys Meyers, Demi Moore, and Lady Gaga in high esteem in the Versace advertising sector,[vague] making them and other celebrities such as Beyoncé and January Jones the personae and images of Versace. Her popularity grew when she designed the Versace Green Dress, also known as the "Jungle-Dress", which was worn by Jennifer Lopez at the Grammys. The company has created the Palazzo Versace resort on the Gold Coast of Australia. The Burj al-Arab, in Dubai, United Arab Emirates (UAE), has a broad collection of Versace furniture and bedding in its expensive and lavish rooms. Plans for the Palazzo Versace, Dubai were announced in May 2005. Gianni Versace SpA, Sunland Group Ltd., and Emirates International Holdings have announced the Palazzo Versace resort to be constructed in the Arabian Bays on the Dubai Creek in Dubai, United Arab Emirates. The second Palazzo Versace would have a number of suites and luxury villas, including a spa. Official plans were to begin construction in 2006 and have the hotel completed sometime in 2008. The interior of the hotel would be furnished with various Versace collections. As Creative Director, Donatella would carry out final plans and design strategies for the hotel and resort compound. This would be the second Palazzo Versace hotel to be built, and the second hotel in Dubai to have a wide range of Versace collections. In October 2002, Gianni and Donatella's best known Versace clothing was displayed in a special exhibit of the Victoria and Albert Museum of London to be honored for extraordinary fashion success and symbolism worldwide. In 2008, Donatella was awarded the FGI Superstar Award. Glamour named her Fashion Designer of the Year in 2012 and 2016 and Woman of the Year in 2010. In 2010, Donatella's charity work earned her a Do Something With Style Award nomination from the VH1 Do Something Awards. She was nominated for providing art supplies to children and creating a tote bag, whose proceeds would go to Starlight and the ONE Foundations. The awards show, produced by VH1, honored people who do good and was powered[vague] by Do Something, an organization that aims to empower, celebrate, and inspire young people. Versace and her former husband, American model Paul Beck have two children: daughter Allegra Versace Beck (born 30 June 1986), and son Daniel Versace (born 1989). Cathy Horyn describes visiting their Milan apartment in 1996: "It was a lavish place, the living room done in Versace prints, but it was also a beautiful and feminine home." Donatella was at the time into drugs and a heavy smoker. Her brother Gianni Versace was murdered on 15 July 1997, outside the re-constructed Casa Casuarina, also known as Versace Mansion, in Miami, Florida. In the aftermath of the highly publicized crime and manhunt, most of the Versace family, including Donatella, moved temporarily to a secluded private resort in the Caribbean. Donatella's daughter Allegra inherited 50% of Versace's entire stock after Gianni's death. She is a patron of the Elton John AIDS Foundation. Versace was commonly parodied by Maya Rudolph on Saturday Night Live. In the ABC series Ugly Betty, a fictional character called "Fabia", played by actress Gina Gershon, is a parody of Donatella. Gershon also played Versace as the lead role in the Lifetime television movie House of Versace, released in 2013. In 1999, director William Friedkin considered Angelina Jolie to portray Donatella, in a small role, in a film which never materialized entitled The Man Who Killed Versace written by Frederic Raphael. Lady Gaga wrote the song "Donatella" from her 2013 album Artpop for her. The plot of season 2 of the television series American Crime Story recounts the murder of Donatella's brother, Gianni Versace. She is portrayed by Penélope Cruz. ↑ According to a January 2018 Vogue interview with Versace, her name is correctly pronounced /vərˈsɑːtʃeɪ/ vər-SAH-chay in English as opposed to the popular pronunciation of /vərˈsɑːtʃi/ vər-SAH-chee. ↑ "You've probably been pronouncing 'Versace' wrong, according to Donatella". Harper's Bazaar. 2018-02-02. Retrieved 2018-03-02. ↑ Barbaglia, Pamela. "Michael Kors snaps up Italy's Versace: sources". Reuters. Retrieved 2018-09-24. ↑ Collins, Lauren (24 September 2007). "Mondo Donatella". The New Yorker: 158. ↑ "Versace Sale At $5.8B Valuation Would Make Heirs Allegra And Santo Billionaires, Donatella Still Out (Forbes.com)". Forbes Magazine. 2013-12-02. Retrieved 2014-10-01. ↑ "Donatella Versace biography (Vogue.com UK)". Vogue.co.uk. 2013-01-22. Retrieved 2014-05-19. 1 2 "Designer Donatella Versace visits Dubai Mall ahead of the Vogue Fashion Dubai Experience | The National". Thenational.ae. 2013-10-10. Retrieved 2014-05-19. ↑ "Do Something". Do Something. Retrieved 2010-07-15. ↑ "Donatella Versace to Receive 'Fashion Icon of The Year' Award". Forbes. 2017-11-30. Retrieved 2018-10-13. ↑ "All the winners from the GQ Men of the Year Awards 2018". GQ. Retrieved 2018-10-13. ↑ "Donatella Versace: «I'll do anything in my power so that Versace remains in history»". MFFashion. 2018-09-25. Retrieved 2018-10-13. ↑ "Every Winner From the 2018 CFDA Awards". Vogue. 2018-06-05. Retrieved 2018-10-13. ↑ "The Green Carpet Fashion Award Winners 2018". Eco-Age. Retrieved 2018-10-13. ↑ "„GQ"-Awards: Hollywood in Berlin". Berliner Morgenpost. 2018-11-08. Retrieved 2018-11-10. ↑ Horyn, Cathy. "Why Fashion Films Are Usually Cartoons". On the Runway Blog. ↑ News, A. B. C. (2017-07-07). "Inside the mind of the serial killer who murdered Gianni Versace". ABC News. Retrieved 2017-09-26. ↑ Horyn, Cathy (2004-06-15). "A New Half-Owner for Versace, and She's Almost 18". The New York Times. ISSN 0362-4331. Retrieved 2017-09-26. ↑ "Our Patrons - Elton John AIDS Foundation". Ejaf.com. Retrieved 2014-05-19. ↑ "Donatella Versace | Designers & Brands - FashionTV Network". Fashiontv.com. 2 May 1955. Archived from the original on 20 May 2014. Retrieved 19 May 2014. ↑ Gael Fashingbauer Cooper (2013-09-05). "Double-take! Gina Gershon becomes an uncanny twin of Donatella Versace - Entertainment". TODAY.com. Retrieved 2014-05-19. ↑ "Donatella Versace Approves of the Love Song Lady Gaga Wrote for Her". Fashionista.com. Retrieved 2014-05-19. ↑ Wagmeister, Elizabeth (2017-01-12). "Lady Gaga Will Not Play Donatella Versace in FX's 'American Crime Story'". Variety. Retrieved 2017-01-12. ↑ Goldberg, Lesley (March 20, 2017). "Penelope Cruz to Star in 'Versace: American Crime Story'". The Hollywood Reporter. Retrieved March 20, 2017. Wikimedia Commons has media related to Donatella Versace.